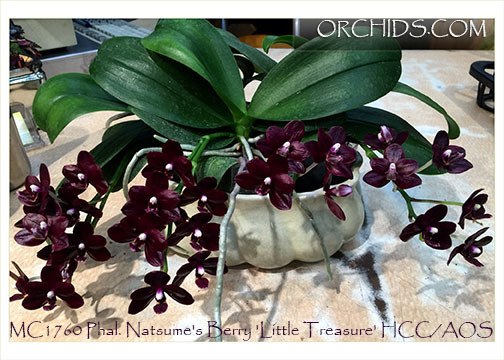 Just awarded an HCC/AOS, bearing seven flowers on its spike, to Mary Mancini, this is an exciting new clone combining two great miniature harlequin parents ! Fuller's Berry, combined with Yu Pin Natsume, has created cardboard-substance flowers that are a blackened dark burgundy & are sweetly fragrant. 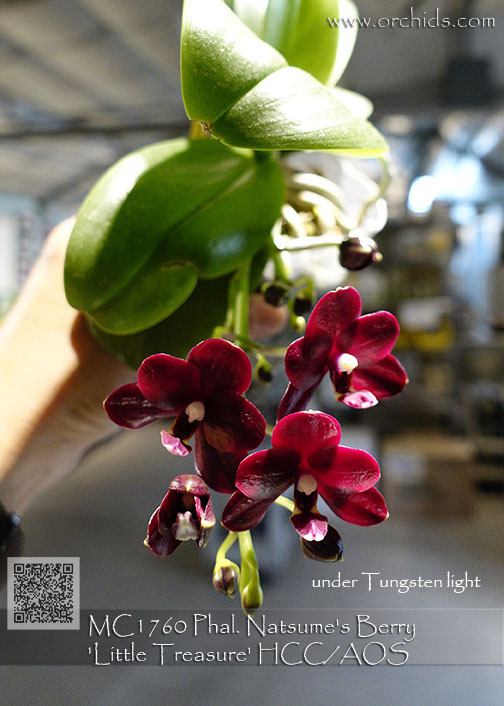 Its rich dark color is the result of layer upon layer of harlequin suffusion coming from both parents, producing a thick flower with heavy color pigment and no hint of any other color. These plants have already flowered once producing two very compact branching spikes in just a 3" pot. Great potential for an upgrade to an AM/AOS when more mature bearing more spikes and flowers. 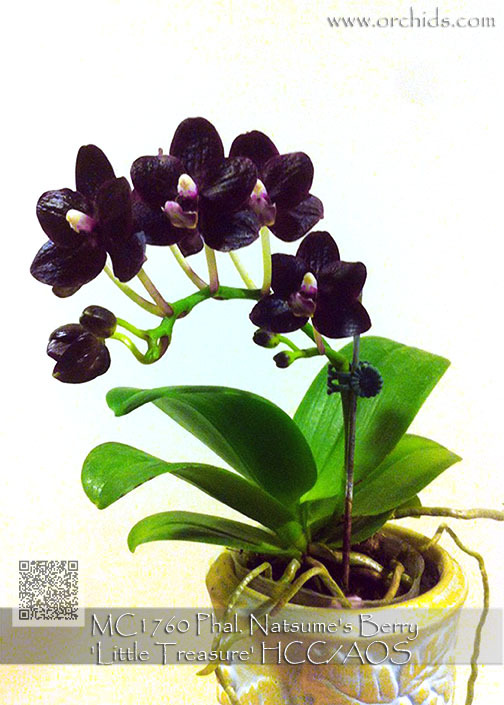 A great new "getting-close-to- black" multi-floral mini that belongs in every cutting-edge Phalaenopsis collection ! 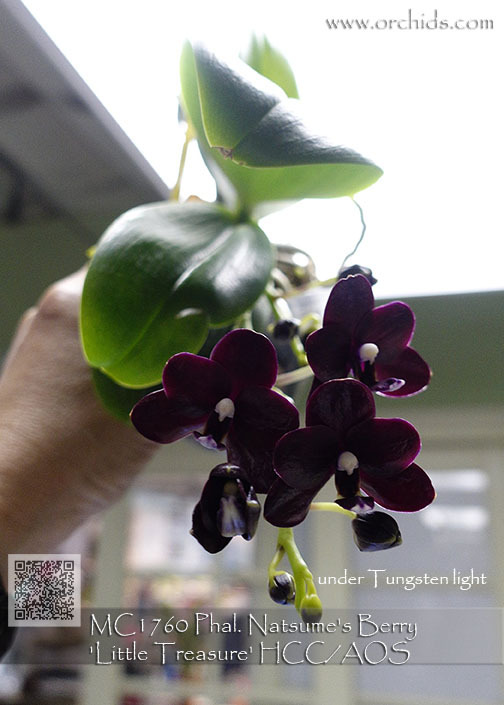 PLEASE NOTE: Light and temperature differences can be a major influence on how certain harlequin-influenced and novelty hybrids bloom in the winter versus the summer. Color saturation and stable patterning is usually strongest during the cooler and brighter months of the winter, with summer’s heat and more shaded growing conditions giving rise to the flower exhibiting more of its background color, if a novelty or, in the case of harlequins, a lessening of the intensity of its marks or harlequin overlay.